This will just be a quick post, but I did want to share this recipe because it was really yummy! A couple of weeks back, we were having company over but didn’t have much time to shop for ingredients. We had some quinoa in the cupboard, and I’d (surprisingly) never cooked with it before, so I went in search of some inspiration for a quinoa salad. I looked at a few recipes, and ended up making a pretty tasty salad that was light but flavorful. I didn’t really measure anything, however I’ve provided some safe guesstimates below. This is one of those recipes that is really open to interpretation though, so if you find you kitchen full of different ingredients, give it a try! I’d venture to guess it’ll be pretty good too. This would also be great with more grilled veggies -- portabella mushrooms, red onions, summer squash. And you can experiment with a dressing -- this dressing was very light, but I thought it was perfect. 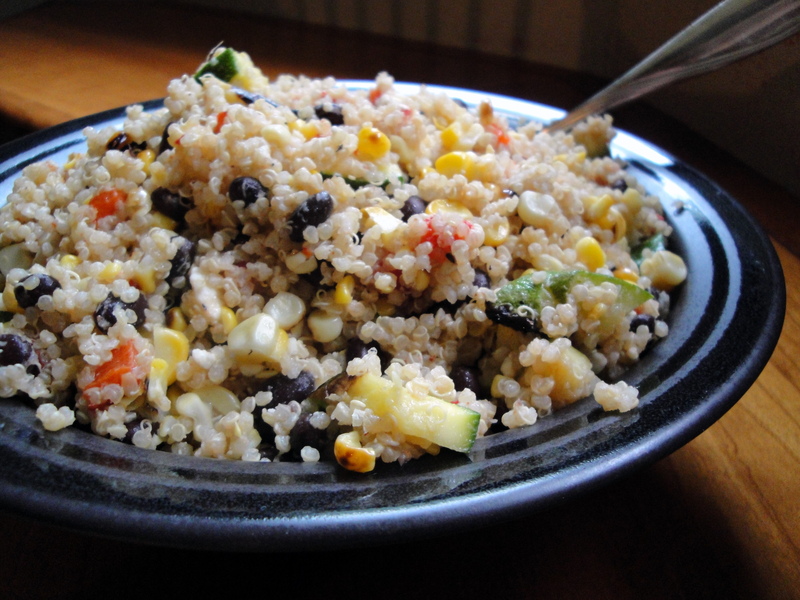 This was a fun recipe for me, because it was easy to make, very eye-pleasing, and showed me how versatile quinoa can be. I'm definitely going to have to use it again. I think I'd like to try it in baking -- any ideas?